Wind Addict season starts on April second. No, not Wind Addict hunting season. 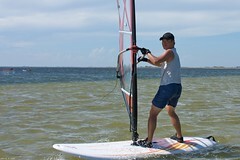 Windsurfing season. This time we're changing a few things though. As before, we're staying for a three day weekend. Unlike previous trips, we're not staying downtown. Instead, we're staying closer to the island. We're staying at Motel 6! Before you get too judgmental, this motel 6 has been remodeled to look like an Ikea commercial. Also, they are closer to the beach, cheaper ($42/night), and they let dogs stay free. We're going to give them a shot. You're welcome to stay downtown if you don't want to party with us.